I love these kinds of images. I was driving through a storm, chasing the light to the west. About ten minutes before I got to this location, I was in the middle of a lightning storm. In addition to the lightning, the rain was coming down in sheets. Indeed, given how much rain we were getting, and given how dark and ominous the skies were, I figured that I would not be able to capture anything for the rest of the day. Still, I continued to drive. 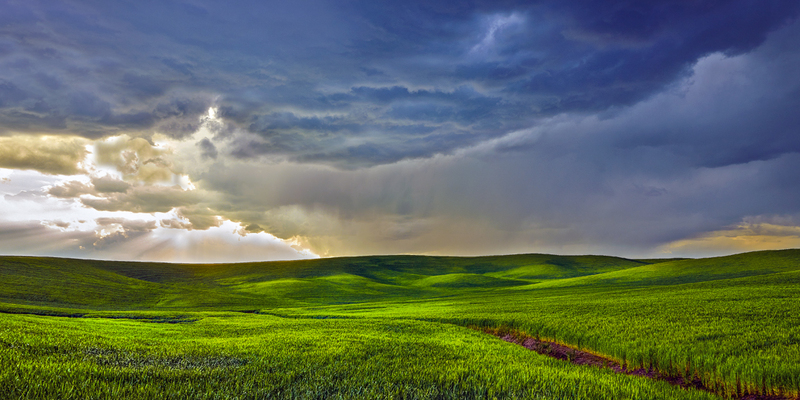 Unexpectedly, though, the sky broke open and dappled sunshine spilled onto the wheat fields. I immediately stopped the car and grabbed my gear out of the back seat. Within a minute I had my tripod set up and I began dialing my settings and composition in. Because of how dynamic the skies were, and given how fleeting the sunlight was, I had very little time to capture this scene. The amazing light that I was privy to for about a minute disappeared just as quickly as it had appeared. Within seconds of wrapping up, the sun was gone and the rain started pouring again.